The prognostic significance of germline mutations in BRCA1 and BRCA2 in women with breast cancer remains unclear. A combined analysis was performed to address this uncertainty. Two retrospective cohorts of Ashkenazi Jewish women undergoing breast-conserving treatment for invasive cancer between 1980 and 1995 (n = 584) were established. Archived tissue blocks were used as the source of DNA for Ashkenazi Jewish BRCA1/BRCA2 founder mutation analysis. Paraffin-embedded tissue and follow-up information was available for 505 women. Genotyping was successful in 496 women, of whom 56 (11.3%) were found to carry a BRCA1/BRCA2 founder mutation. After a median follow-up period of 116 months, breast cancer specific survival was worse in women with BRCA1 mutations than in those without (62% at 10 years versus 86%; P < 0.0001), but not in women with the BRCA2 mutation (84% versus 86% at 10 years; P = 0.76). Germline BRCA1 mutations were an independent predictor of breast cancer mortality in multivariate analysis (hazard ratio 2.4, 95% confidence interval 1.2–4.8; P = 0.01). BRCA1 status predicted breast cancer mortality only among women who did not receive chemotherapy (hazard ratio 4.8, 95% confidence interval 2.0–11.7; P = 0.001). The risk for metachronous ipsilateral cancer was not greater in women with germline BRCA1/BRCA2 founder mutations than in those without mutations (P = 0.68). BRCA1 mutations, but not BRCA2 mutations, are associated with reduced survival in Ashkenazi women undergoing breast-conserving treatment for invasive breast cancer, but the poor prognosis associated with germline BRCA1 mutations is mitigated by adjuvant chemotherapy. The risk for metachronous ipsilateral disease does not appear to be increased for either BRCA1 or BRCA2 mutation carriers, at least up to 10 years of follow up. The major breast cancer predisposing genes BRCA1 and BRCA2 were identified in 1994 and 1995, respectively [1, 2]. Unfortunately, the optimal clinical approach to women who develop hereditary breast cancer remains incompletely defined. Studies of the outcomes of women with BRCA1/BRCA2-related cancer have yielded conflicting results. Several reports suggested that women with germline mutations in BRCA1 are more likely to die from their disease than are women with sporadic breast cancer [3–6]. However, other studies did not confirm these observations [7, 8]. Fewer studies have focused on BRCA2-related breast cancer [9, 10]. Certain unique barriers have impeded the analysis of germline BRCA1/BRCA2 status as a prognostic factor. Because informed consent is required for genetic testing, and individuals may decline such testing for a variety of reasons, it has been difficult to develop prospective cohorts for outcome studies. On the other hand, testing generally requires the provision of a blood sample, which may introduce a survival bias in the conduct of retrospective studies. Both of these potential selection biases may be avoided through the use of a retrospective design in which BRCA1/BRCA2 mutations are sought in archival tissue from women who have undergone treatment for cancer, and in whom the clinical outcomes are known. Genetic testing is performed on anonymized tissue specimens, and comparisons are made between the women who do and those who do not have mutations. This design presupposes that the BRCA1/BRCA2 mutation spectrum in the study group is limited and predefined. This is the case for women of Ashkenazi Jewish descent, because two specific mutations of BRCA1 (185delAG and 5382insC) and one mutation of BRCA2 (6174delT) constitute the great majority of mutations identified in this population, and these are easily detectable in paraffin-embedded material [11–14]. The present study employed this retrospective, anonymized design to examine the outcomes of Ashkenazi women with invasive breast cancer undergoing breast-conserving therapy (BCT) at two institutions in the USA and Canada. Patients from Memorial Sloan-Kettering Cancer Center (MSKCC) were identified as previously described . Briefly, clinical databases from the Departments of Pathology, Surgery, and Radiation Therapy were reviewed to identify women who underwent BCT (wide local excision and radiation, with or without axillary node dissection) between 1 January 1980 and 31 December 1990. Hospital registration databases were then cross-referenced to identify women expressing Jewish religious preference. Of the 393 Jewish women undergoing BCT, paraffin-embedded tissue and follow-up information was available for 314 women. Information on tumor grade was not available. The combined impact of germline mutations in BRCA1/BRCA2 on prognosis in this group of women was reported in a previous publication . For the present study the clinical database was extended and additional analyses were performed evaluating the prognostic impact of interactions between germline status, hormone receptor status, and adjuvant treatment with either tamoxifen or chemotherapy. The clinical impact of germline mutations in BRCA1 and BRCA2 were considered separately. Ashkenazi Jewish women diagnosed with invasive non-metastatic breast cancer at age 65 years or less, who were treated at Sir Mortimer B. Davis-Jewish General Hospital (SMBD-JGH) between 1 January 1980 and 1 November 1995, were identified from the Medical Records Department. Of 292 women identified, 225 underwent breast-conserving surgery. Of these 225 women, 34 did not receive radiation and are excluded from further consideration. Paraffin-embedded tissue and follow-up information was available for the remaining 191 women, who were included in the analysis. Results relating to germline mutations in BRCA1 for the entire dataset were recently reported . The study was focused on those receiving BCT to harmonize the ascertainment criteria between the two centers and to focus on ipsilateral cancer recurrence. The two studies were combined to increase the sample size and thereby the power to observe the separate effects of mutations in BRCA1 and BRCA2, which was not previously possible with either dataset alone. Study procedures at each institution were approved by the local institutional review board. For each subject, paraffin-embedded material was retrieved from hospital tissue banks and clinical records were reviewed. In order to comply with guidelines regarding the conduct of genetic research on stored tissue samples, only a limited amount of clinical data was extracted from the medical record, including age at diagnosis (< 50 or ≥ 50 years), tumor size (≤ 2 cm or > 2 cm), lymph node involvement (present or absent), hormone receptor status (if available), and adjuvant treatment with chemotherapy or tamoxifen. Time to development of local or distant recurrence was recorded, as was the time to development of contralateral breast cancer, if any. Clinical follow-up information was obtained by chart review, tumor registry query, and contact with the treating physician. The tissue specimen and clinical data for each subject were associated through a unique study identifier. At MSKCC, the link between study identifier and patient identifying information was irretrievably destroyed before genetic analysis was performed. At the SMBD-JGH, the mutation results were anonymized and separated from any personal identifiers in a manner approved by the local institutional review board. Analysis of the paraffin-embedded specimens was performed as previously described [3, 15]. Briefly, paraffin sections were obtained from the retrieved tissue blocks and genomic DNA was isolated by standard protocols. At MSKCC normal lymph node was preferentially examined, whereas at SMBD-JGH tumor tissue was studied. All specimens were analyzed by PCR amplification of the regions surrounding the Ashkenazi founder mutations 185delAG and 5382insC in BRCA1 and 6174delT in BRCA2. Radiolabeled PCR products were visualized by denaturing PAGE followed by autoradiography. The detection of characteristic variant bands indicated the presence of the mutation being studied. Variant bands were confirmed by direct sequencing or by an independent PCR amplification of the corresponding DNA sample and repeat analysis. There were no discordant results upon repeat analysis. DNA samples from nine patients failed to yield PCR products despite repeat analysis. Therefore, the final study group consisted of 496 women. There were 24 women who underwent contralateral BCT for metachronous breast cancer during the period of the study. Thus, for the purposes of determining the rate of metachronous ipsilateral cancer, there were 520 breasts at risk in the dataset. Clinical characteristics of women with and without germline BRCA1/BRCA2 founder mutations were compared using a χ2 test. For the survival analyses, breast cancer specific mortality was chosen as the main end-point for the study in order to avoid possible confounding by death due to other causes, such as malignancies of other anatomic sites. Overall survival, defined as the time from diagnosis to death from any cause, was evaluated as a secondary end-point. All ipsilateral breast cancer events were considered in the calculation of the cumulative incidence of metachronous ipsilateral breast cancer, because the retrospective design of this study did not allow reliable discrimination between true recurrences and separate metachronous primaries. All contralateral breast cancer diagnoses were considered new primary lesions for the purposes of calculating the cumulative incidence of contralateral breast cancer. Women who had undergone contralateral mastectomy before the breast cancer diagnosis for which they underwent breast conservation (n = 7) were excluded from the analysis of this end-point. Patients were censored if they had not experienced the end-point of interest at the time of last follow up. Kaplan–Meier estimates of breast cancer specific survival time were compared using the log-rank test. A Cox proportional hazards model was used to estimate the hazard ratios (HRs) for breast cancer specific survival time under a multivariate model. All other end-points were analyzed after accounting for death due to causes other than breast cancer as a competing risk. The cumulative incidences of the end-points in women with and without mutations were compared with a χ2 test fit using the method of Gray . P values comparing the overall curves corresponding to the end-point of interest are provided for these univariate comparisons. The cumulative incidences of death due to breast cancer and due to causes other than breast cancer are both calculated in the same analysis, and shown in separate figures. Multivariate proportional hazards models accounting for non-breast-cancer death as a competing risk were fitted using the method of Fine and Gray . All P values were calculated using two-sided tests. BRCA1/BRCA2 mutations were identified in 56 (11.3%) of 496 patients (42 BRCA1 [32 women carried the 185delAG and 10 carried the 5382insC mutation], 13 BRCA2 [all 6174delT], and one both BRCA1 and BRCA2 [185delAG and 6174delT]). The clinical characteristics of women with BRCA1, BRCA2, and no germline BRCA1/BRCA2 mutations are presented in Table 1. Women with germline BRCA1 mutations were significantly more likely than women without these specific mutations to be diagnosed before the age of 50 years, to be diagnosed with estrogen receptor negative tumors, and to have received adjuvant chemotherapy. BRCA1 mutation carriers were significantly less likely than noncarriers to have received tamoxifen (Table 1). In women with BRCA1 mutations, neither tumor size nor axillary nodal involvement differed significantly from noncarriers. Among those for whom data were available, BRCA2 mutation carriers were more likely than BRCA1 carriers to have estrogen receptor positive tumours (odds ratio 10.5; P = 0.004) and to have received adjuvant tamoxifen (odds ratio 5.4; P = 0.02). For no other variable was the distribution significantly different between BRCA2 mutation carriers and either BRCA1 carriers or noncarriers. *Cases in which the characteristic of interest is unknown are not included in the comparisons. †Woman with both BRCA1 and BRCA2 founder mutations are included in both groups, hence the total number women listed here is 497. The median follow-up period for surviving women was 116 months. There were 79 women who died from breast cancer, 34 who died from causes other than breast cancer, and one whose cause of death was unknown. There were 18 deaths due to breast cancer among the 57 women with BRCA1/BRCA2 mutations. Sixteen deaths occurred among 43 BRCA1 carriers and two among 14 BRCA2 carriers, and there were 61 breast cancer related deaths among the 439 women who did not have a detectable BRCA1/BRCA2 mutation. At 10 years, the cumulative incidence of death due to breast cancer among BRCA1/BRCA2 mutation carriers was 33%, as compared with 14% among noncarriers (P = 0.0002). However, the negative impact of mutation status was not evenly distributed among BRCA1/BRCA2 carriers, because the probability of death due to breast cancer among BRCA1 mutation carriers was 38% at 10 years (P < 0.0001, versus noncarriers; Fig. 1 and Table 2) and 15.5% among women with the BRCA2 founder mutation (P = 0.76 versus non-carriers; Table 2). There was no difference between women with and those without BRCA1/BRCA2 mutations with respect to the probability of death due to causes other than breast cancer (P = 0.38; Fig. 2). Cumulative incidence of death due to breast cancer among women with (····) and those without (--) germline BRCA1 mutations (P < 0.0001). Cumulative incidence of death due to causes other than breast cancer in women with (--) and in those without (-·-) germline BRCA mutations (P = 0.38). In univariate analyses, age under 50 years at initial diagnosis, presence of a BRCA1 mutation, primary tumor size greater than 2 cm, estrogen receptor negativity, axillary nodal involvement, and receipt of adjuvant chemotherapy were all significantly associated with poorer breast cancer specific survival (Table 2). Adjuvant treatment was not randomly assigned, and therefore the association between administration of chemotherapy and a poor outcome (P < 0.0001) is probably accounted for by the fact that women who were given chemotherapy had a higher a priori probability of death than did those not receiving adjuvant chemotherapy. For this reason, use of chemotherapy was not included as a variable in the final multivariate model. In a multivariate competing risk analysis of breast cancer specific survival, we included only those variables that were significant in the univariate analysis. The final, most parsimonious model is shown in Table 3. BRCA1 mutation status retained independent prognostic significance (HR 2.39, 95% confidence interval [CI] 1.20–4.75; P = 0.01), along with tumor size greater than 2 cm (HR 2.19, 95% CI 1.30–3.67; P = 0.003) and axillary nodal involvement (HR 1.78, 95% CI 1.07–2.96; P = 0.03). Women diagnosed after the age of 50 years were less likely to die from breast cancer than were younger women (HR 0.55, 95% CI 0.33–0.92; P = 0.02; Table 3). The models were essentially unchanged when overall survival was the end-point. The presence of the BRCA2 mutation was not a significant prognostic factor in either univariate (Table 2) or multivariate analysis (data not shown). Of the 468 women in the study for whom information regarding adjuvant chemotherapy was available, 187 received chemotherapy and 281 did not. In univariate analysis the presence of a germline BRCA1 mutation was significantly associated with a worse breast cancer specific survival both among those women who received chemotherapy (10-year breast cancer mortality 41% in carriers versus 24% in noncarriers; P = 0.04) and among those who did not (10-year breast cancer mortality 24% in carriers versus 9.6% in noncarriers; P = 0.008). The presence of a germline BRCA1 mutation remained an independent predictor of breast cancer mortality in multivariate analysis of the group of women who did not receive chemotherapy (HR 4.8, 95% CI 2.0–11.7; P = 0.001), but not in those women who did receive adjuvant chemotherapy (HR 1.5, 95% CI 0.66–3.49; P = 0.33). There were 208 women who received adjuvant tamoxifen and 237 who did not. Tamoxifen usage was not a significant predictor of outcome in univariate analysis. However, in multivariate analysis, among those not receiving tamoxifen, the presence of a germline BRCA1 mutation was significantly associated with breast cancer specific survival (HR 3.5, 95% CI 1.7–7.2; P = 0.001). By contrast, BRCA1 mutations had no prognostic value in those who did receive tamoxifen (HR 0.5, 95% CI 0.05–5.0; P = 0.55). A total of 496 patients in the present study underwent BCT for 520 invasive breast cancers. There was no significant difference between women with and those without BRCA1/BRCA2 mutations in the risk for metachronous ipsilateral breast cancer at 10 years (12% in women with mutations versus 8% in women without; P = 0.68; Fig. 3). Age under 50 years at initial diagnosis was the only significant predictor of metachronous ipsilateral disease (P = 0.002). Women with mutations were significantly more likely to develop contralateral breast cancer at 10 years (27% in women with mutations versus 8% in women without; P < 0.0001, based on a competing cause analysis; Fig. 4). The risk for contralateral cancer was similar in women with BRCA1 mutations (27% at 10 years) and in those with the BRCA2 mutation (32% at 10 years). In univariate analyses, which were adjusted for death from competing causes, women not using tamoxifen experienced a higher incidence of ipsilateral breast cancer (HR 1.97, 95% CI 1.01–3.86; P = 0.05). Those not using tamoxifen also had a marginally, nonsignificantly higher incidence of contralateral breast cancer (HR 1.26, 95% CI 0.71–2.25; P = 0.48). Chemotherapy did not have a significant effect on either ipsilateral (P = 0.16) or contralateral (P = 0.36) breast cancer incidence. In an analysis restricted to mutation carriers, the contralateral breast cancer risk was lower in BRCA1/BRCA2 mutation carriers receiving tamoxifen than in those not receiving tamoxifen, although this did not reach statistical significance (risk ratio 0.47, 95% CI 0.14–1.59; P = 0.23). The effect of tamoxifen on contralateral breast cancer risk was not significantly greater in women with a BRCA2 mutation than in women with BRCA1 mutations, although this analysis was limited by the small numbers of women in each group. Cumulative incidence of metachronous ipsilateral breast cancer in women with (--) and in those without (--) germline BRCA mutations (P = 0.68). Cumulative incidence of metachronous contralateral breast cancer in women with (····) and in those without (--) germline BRCA mutations (P < 0.0001). Although BRCA1 and BRCA2 were identified in 1994 and 1995, the influence of germline BRCA1/BRCA2 mutations on the outcome of women with breast cancer has remained undefined. Several retrospective studies of affected mutation carriers identified by familial cancer risk clinics failed to demonstrate any differences in survival when women with mutations were compared with various control groups (for reviews [19, 20]). However, because only women who survived their breast cancer were able to undergo genetic testing and be identified as mutation carriers in these prevalent series, a survival bias may have prevented the detection of a negative impact of BRCA1/BRCA2 mutations on outcome. The anonymized design of the current retrospective study circumvented this potential bias by ensuring that all patients within the study group were genotyped, without regard for vital status. In the present study, women undergoing BCT for early stage invasive breast cancer demonstrated significantly shorter breast cancer specific and overall survival if they carried a germline BRCA1 mutation but not a BRCA2 mutation. This suggests that the clinical outcome of women with germline mutations may vary depending on which gene is mutated, and even possibly on the position of the mutation within a particular gene. However, the present study, examining the consequences of an intentionally restricted set of mutations in a limited sample, cannot definitively resolve this question. Larger studies, preferably of prospectively ascertained incident cohorts, are necessary. The adverse prognosis conferred by a BRCA1 mutation was not attributable to differences in tumor size or axillary nodal status, which indicates that the impact of germline status on clinical outcome is not the result of an association with advanced stage at diagnosis. Several studies have demonstrated that breast cancers arising in women with BRCA1/BRCA2 mutations, particularly those in BRCA1, frequently manifest adverse pathologic and biologic features, such as high histologic grade, hormone receptor negativity, p53 mutation, aneuploidy, and high S-phase fraction . Studies conducted in sporadic breast cancer have previously demonstrated the negative prognostic significance of each of these factors. Whether the prognostic significance of BRCA1/BRCA2 status is completely independent of all of these other parameters cannot be resolved by the present study. BRCA1-related breast cancers in this series, as in others, were significantly more likely to be estrogen receptor negative than were cancers not associated with BRCA1 mutations, and estrogen receptor status was associated with breast cancer mortality in univariate analysis. However, germline status remained a significant prognostic indicator in the multivariate model, indicating that the adverse effect of mutation status on outcome is independent of the association with estrogen receptor negative phenotype. The robustness of this observation is limited to some degree by the fact that receptor status was unknown for a significant proportion of patients, in part because some of these cases were diagnosed before routine receptor testing and in part because the small size of some tumors prevented receptor determination using the dextran-coated charcoal method in use at the time. The design of the present study precluded a separate analysis of the role of grade in determining outcome in BRCA1 carriers. However, it is known that the majority of BRCA1-related breast cancers are high grade, infiltrating ductal breast cancers . It would not significantly change the conclusions of this study if it could be demonstrated that the independent negative impact observed is attributable to the 'downstream' phenotypic consequences of the presence of a BRCA1 mutation. Some preclinical studies have demonstrated that mouse embryonic cells lacking functional Brca1 protein are sensitive to specific chemotherapeutic agents such as cisplatinum and mitomycin C [22, 23], and similar results have been seen in human breast cancer cells null for BRCA1 protein . These observations have raised the possibility that human BRCA1-associated breast cancers might also be differentially sensitive to chemotherapy. The current analysis is consistent with this hypothesis, because the negative prognostic influence of a germline BRCA1 mutation appeared to be reduced in women receiving adjuvant chemotherapy, and, in fact, lost independent statistical significance in this group. Furthermore, standard chemotherapy regimens do not include mitomycin-C or cisplatinum, and it remains possible that BRCA1-associated breast cancers may be even more sensitive to these agents. However, the design of the present study is such that these observations must be considered hypothesis generating. Further exploration should take place within the context of prospective trials. In the present study, women with germline mutations experienced a risk for metachronous ipsilateral breast cancer that was not significantly different from that in women without mutations. Several studies have described the incidence of subsequent ipsilateral disease in women with BRCA1/BRCA2 mutations undergoing BCT [7, 8, 15, 25, 26]. In these series, ipsilateral tumor recurrence rates ranged from 1% to 20% at 5 years, which are in the range previously reported in series of young women undergoing BCT. A recent analysis of mutation carriers who had survived a mean of 14 years after their breast cancer diagnosis  indicated a 49% estimated risk for ipsilateral cancer after 10 years of follow up. However, studies such as this, which analyze prevalent groups of long-term survivors, may overestimate the risk that a newly diagnosed woman with a BRCA1/BRCA2 mutation will suffer an ipsilateral breast cancer, because a significant fraction of newly diagnosed women will unfortunately die from their breast cancer and thus will not have lived long enough to develop a second ipsilateral tumor. Thus, ipsilateral cancer estimates derived from such studies may be misleading for newly diagnosed women attempting to make the difficult choice between breast conservation and bilateral mastectomy. Taken together, the results of the available series suggest, at least up to 10 years of follow up, that women with BRCA1/BRCA2 germline mutations have a risk for ipsilateral recurrence that is similar to that of other young women. Studies based on series of prevalent cases [8, 26, 27] suggest, however, that women who are long-term survivors may have an increased risk of new second primary malignancies within the treated breast. This interpretation is supported by a further analysis of cases reported by Haffty and colleagues , in which all eight patients with deleterious BRCA1/BRCA2 mutations had new primary ipsilateral breast cancer, whereas patients without deleterious mutations had both true recurrences and new primary breast cancers (P = 0.06). The cancers occurring in BRCA1/BRCA2 carriers occurred at a mean time interval of 9.6 years following the initial diagnosis. Women with BRCA1/BRCA2 mutations are at substantial increased risk for metachronous contralateral breast cancer throughout the follow-up period. 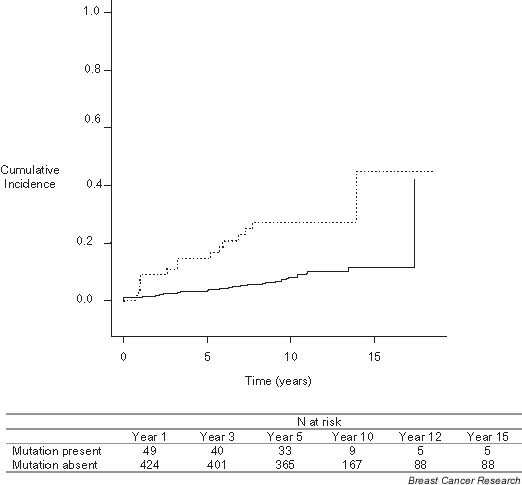 Although this increased contralateral risk could reflect an increased sensitivity to radiation-induced malignancies initiated by scatter from adjuvant radiotherapy, the contralateral incidence rate is similar to that observed in affected mutation carriers after mastectomy  and in prospectively followed cohorts of heterozygotes [30, 31], which suggests that the observed contralateral breast cancers are most likely the direct result of the underlying genetic predisposition. The apparent paradox of differential ipsilateral and contralateral risk, as well as differences in estimates of ipsilateral risk according to duration of follow up, may be explained by a model that proposes that women presenting with BRCA1/BRCA2-associated breast cancer have multiple foci within both breasts at various stages of evolution toward malignancy. These foci may be eliminated or substantially retarded by adjuvant radiotherapy of the initially affected breast, preventing or delaying their appearance as metachronous ipsilateral cancers. In the untreated contralateral breast, however, occult lesions existing at the time of initial diagnosis could proceed unimpeded in their progression to malignancy, resulting in an unaltered risk for contralateral cancer. Extending the hypothesis, the continued presence of the genetic predisposition may permit the process of carcinogenesis in the affected breast to begin anew once the radiation treatment was completed, and, after a delay, metachronous breast cancers would begin to appear in the treated and untreated breasts at similar rates. This hypothetical model could be tested by careful pathologic examination of breasts of women with BRCA1/BRCA2 mutations undergoing either therapeutic or prophylactic mastectomy to assess the prevalence of occult premalignant and malignant lesions. The results of early reports are conflicting, but there is some evidence for an excess of premalignant changes, particularly for BRCA2 mutation carriers [32–34]. Nonsurgical options for breast cancer risk reduction in women with BRCA1/BRCA2 mutations are limited. A previous case–control study  suggested that tamoxifen reduced the risk for contralateral cancer by nearly 50% in mutation carriers, but this benefit was not observed in a prospective trial of primary prevention among unaffected women with BRCA1 mutations . In the present study, a trend toward a reduction in contralateral breast cancer was seen in mutation carriers who received the drug, although this did not achieve statistical significance. Because the number of women with mutations who received tamoxifen was small, the present series cannot satisfactorily address whether the benefit of tamoxifen in reducing contralateral risk varies between women with BRCA1 and those with BRCA2 mutations. It is of interest that the degree of contralateral risk reduction experienced by the mutation carriers taking tamoxifen in the study was similar to that reported in the previous case–control study, and there was no clear difference between the effects observed in BRCA1 and BRCA2 mutation carriers, but further studies of larger numbers of women are needed before these data can be used to guide clinical practice. Retrospective anonymized studies such as the one reported here may be more easily performed in populations with a high prevalence of specific founder BRCA1/BRCA2 mutations, such as the Ashkenazim. Non-founder mutations are not identified with this design, and a small number of individuals will thus be misclassified as 'mutation negative' when, in fact, they carry a unique deleterious alteration. However, the number of such cases is likely to be small. In a recent report of 322 Ashkenazi individuals who underwent full sequence analysis of BRCA1 and BRCA2 after negative founder mutation testing, only six (1.9%) were found to carry a unique mutation . Because women undergoing complete sequencing were probably encouraged to do so because of a family history of breast or ovarian cancer, the prevalence of unique mutations is likely to be even lower in an unselected population of breast cancer patients such as those reported in the present study. Thus, false-negative classification is unlikely to have significantly affected the results of this study. Nonetheless, the results of the study may not be applicable to all women with BRCA1/BRCA2 mutations. The majority of mutation carriers in the study carried either BRCA1 185delAG (32 out of 42 [76%] of all BRCA1 mutation carriers) or BRCA2 6174delT. It is possible that other mutant alleles may confer different risks for recurrence. This combined study demonstrates that women with specific BRCA1/BRCA2 mutations who develop breast cancer are at increased risk for death from their disease, particularly if the mutation is in BRCA1. For up to 10 years after diagnosis, the risk for metachronous ipsilateral cancer is similar to that in women without mutations, but the risk for contralateral disease is substantially higher. Taken together, these findings suggest that the possibility of BRCA1/BRCA2-associated breast cancer should be taken into account with other factors when making decisions regarding radiotherapy and adjuvant chemotherapy, but should not be used as a sole factor to determine the appropriateness of BCT. Adjuvant tamoxifen should be given when appropriate to BRCA1/BRCA2 mutation carriers with hormone receptor positive breast cancer, but despite promising data, the true effectiveness of this agent in reducing contralateral breast cancer risk in this group of women remains uncertain. Mark E Robson, Pierre O Chappuis contributed equally to this work. Sir Mortimer B. Davis-Jewish General Hospital. This work was supported by US Army Medical Research and Materiel Command DAMD17-98-1-8112, Canadian Genetic Diseases Network and Susan G Komen Foundation (WDF), US Army Medical Research and Materiel Command DAMD 17-01-1-0325 and American Cancer Society PRTA-38 (MR), Fonds de perfectionnement des Hôpitaux Universitaires de Genève, Geneva, Switzerland (POC), and Danziger Foundation and Breast Cancer Research Foundation (KO). WDF is a Senior Clinicien Chercheur Boursier of the Fonds de la Recherche en Santé du Québec. We wish to thank Nancy Hamel and Jean-Sébastien Brunet for technical and statistical assistance.